Synthetic gem crystals have been manufactured since the late 1800s, and their production is often marked by a need for them in industrial applications outside of the jewelry industry. The first success was in producing synthetic ruby of faceting quality. Synthetic crystals are used in communications and laser technology, microelectronics, and abrasives. Because synthetics for jewelry applications can be “made to order” [i.e. consistent color and crystal shape] given the right ingredients, time, and the facilities to grow them, they are likely to be much less rare than natural gems of equal size, clarity, and saturation of color. Because of this, and because it is possible to confuse them with gems that are naturally occurring, there are strict guidelines regarding how they are marketed and sold. In the United States, the Federal Trade Commission requires that any gem material produced in a laboratory be described in a way that leaves no doubt that it was not produced naturally. It is considered to be a deceptive practice if a synthetic gem material’s origin is not clearly disclosed throughout the distribution channel at the time of sale, from the manufacturer to the consumer. There are also a number of industry organizations such as the American Gem Trade Association (AGTA), the International Colored Gemstone Association (ICA), and the World Jewellery Confederation (CIBJO) that have formulated specific guidelines for their members regarding the disclosure of synthetic gems at the time of sale. In the last decade fewer new kinds of man-made gem materials have been marketed. This suggests that the repertoire of synthetic gem materials is close to reaching its limit in terms of the creation of new materials, but it is not limited in production which is still very significant. During the last century, researchers have developed a number of different ways to create these synthetic gem materials in the laboratory. Most of these methods fall into two major categories – melt or solution. 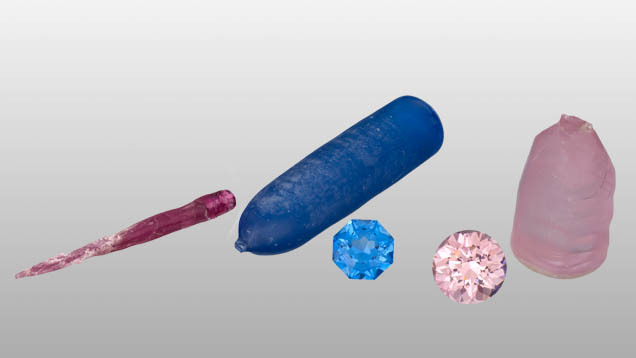 The first commercially successful synthetic gems were created by the flame fusion process. This process involves dropping powdered chemicals through a high-temperature flame, where it melts and falls onto a rotating pedestal to produce a synthetic crystal. Today it remains the least expensive and most common way to make gems such as synthetic corundum and spinel. Pulling emerged in the early 1900s. In this process, nutrients are melted in a crucible and the synthetic crystal grows from a seed that is dipped into the melt, and then slowly pulled away from the melt as it grows. Gems synthesized by pulling include synthetic alexandrite, chrysoberyl, corundum, and garnet. Today some synthetic gems, such as emerald, ruby, sapphire, alexandrite, and spinel can be created through a flux-growth process. Flux is a solid material that, when melted, dissolves other materials in the same way that water dissolves sugar. As the dissolved chemical solution gradually cools, synthetic crystals form. Growing a synthetic gem by the flux method requires patience and significant investment. Crystal growth can take up to a year, and the equipment is very expensive. But the results, especially when it comes to emerald, are well worth the time and effort. Like the flux process, the hydrothermal growth process is slow and expensive. But it’s the only method for successfully growing synthetic quartz. This process requires heat and pressure and imitates the conditions deep in the earth that result in the formation of natural gems. Nutrients are dissolved in a water solution, and then synthetic crystals form as the solution cools. These diamonds, grown in a laboratory, share most of the characteristics of their natural counterparts: they are essentially carbon. Chemical vapor deposition (CVD) – diamond growth in a vacuum chamber due to a chemical reaction which releases carbon atoms that precipitate on diamond seed plates. Some synthetic diamonds are produced by chemical vapor deposition (CVD), such as this group. 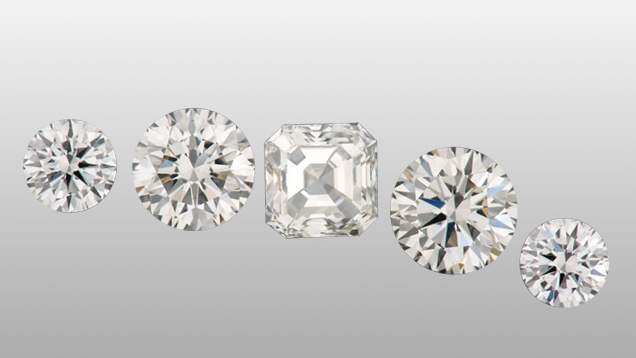 Some diamonds are made in high pressure high temperature environments, including this collection of synthetic diamonds in a variety of colors. 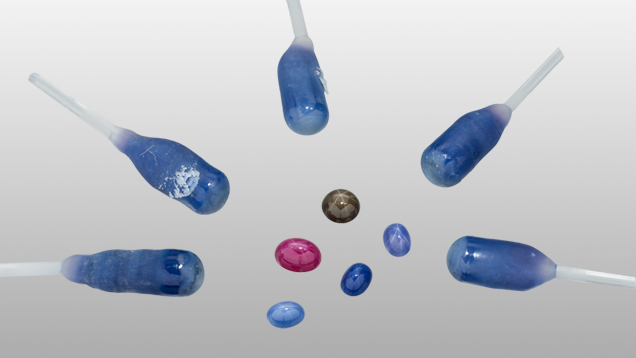 Synthetic corundum, which includes ruby and sapphire, can be made by the greatest number of processes. Because of this, synthetic corundum is available at many price levels, from very affordable to very expensive. Synthetic corundum can be made in a variety of ways including this colorful collection of flame fusion crystals, seen before cutting. Ruby – in the late 1800s, ruby became the first gem to be created in a laboratory by Auguste Verneuil. In 1902, he announced the development of his flame-fusion process for synthesizing this beautiful gem. 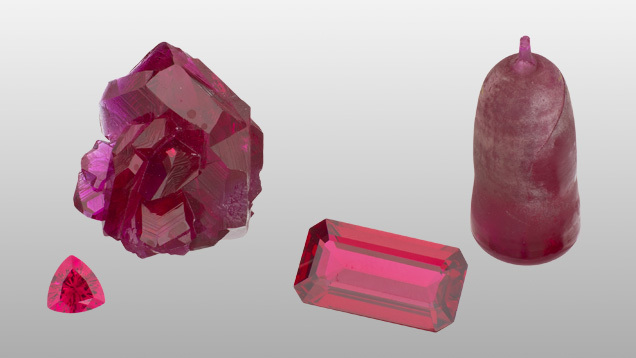 Synthetic ruby can be produced via flux growth processes (crystal and cut stone on left), and flame fusion (boule and cut stone on right). Sapphire – some of the earliest examples of synthetic sapphires are in original pieces of art nouveau and art deco jewelry. Many synthetic sapphires are still made by flame fusion, but flux-grown sapphires have been available since the 1960s. Flux-grown, pulled and hydrothermal synthetic sapphires can be very convincing substitutes for the natural gem. Color change synthetic sapphire, made to imitate alexandrite, has been popular since the early 1900s. Induced inclusions caused star effects in some synthetic ruby and sapphire. 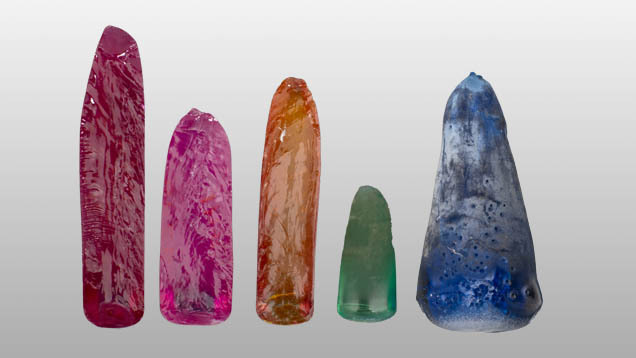 Synthetic sapphires can be manufactured to show asterism (star effect), in cabochon cut stones, such as these. Synthetic beryl is available in many colors including yellow, red, blue (aquamarine) and green (emerald). In the late 1980s and 1990s, Russia became a significant producer of these synthetic gems and is still a major supplier of hydrothermally grown gemstones such as synthetic beryl and synthetic corundum, along with others like synthetic diamond and synthetic alexandrite. 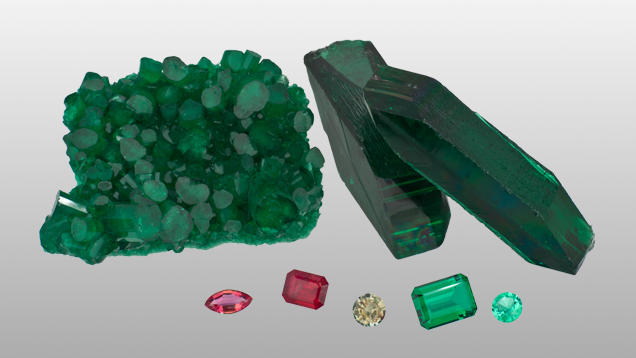 These are examples of synthetic beryl crystals and cut stones (including the synthetic emerald variety—the green stones). Emerald – in the late 1930s, scientists finally synthesized a commercially profitable flux-grown version of this desirable deep green gem. 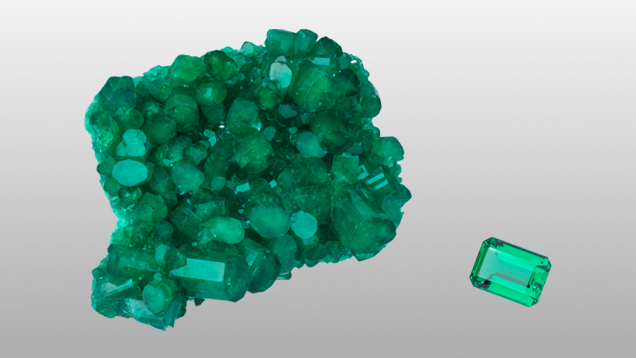 Hydrothermal synthetic emerald for jewelry came on the scene in 1960. 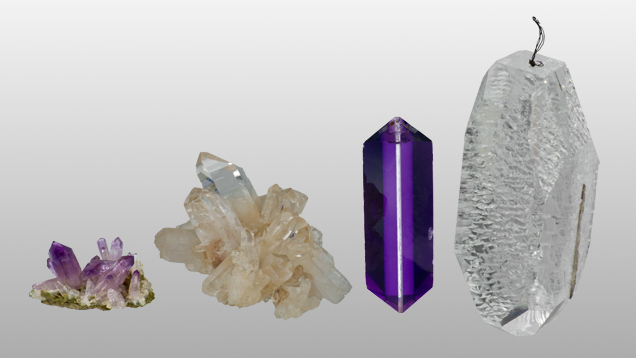 Gem-quality quartz, such as citrine, rose quartz, smoky quartz, and amethyst, is attractive. But natural gem-quality quartz is plentiful so scarcity is not the reason that researchers went to the trouble of developing a way to synthesize gem-quality quartz. The reason is that it plays a key role in technology. It can generate an electric current when it’s placed under pressure and can vibrate in precise response to alternating current. These virtues are put to practical use in watches, clocks, communications equipment, filters, and oscillators. Amethyst: Lab-grown amethyst and other synthetic quartz varieties found their way into jewelry after being developed for industrial applications. The first hydrothermal quartz appeared in laboratories in the 1890s. It wasn’t until World War II that synthetic quartz was widely available commercially. Natural amethyst and rock crystal quartz crystals (left) and synthetic amethyst and synthetic rock crystal quartz crystal (right). Early in the twentieth century, researchers trying to grow synthetic blue sapphire produced synthetic blue spinel by accident. Since then, synthetic spinel has been commonly used as a substitute for many natural gems. In the 1990s, a new Russian-made, flux-grown synthetic spinel was introduced in a variety of colors including red, a color not widely available through the older flame-fusion process. Synthetic spinels seen here are in crystal form as they appear from the manufacturer. 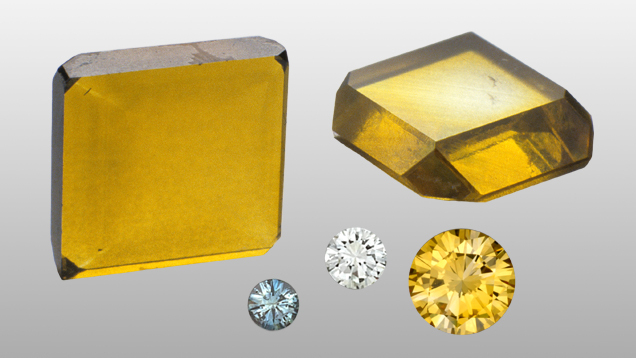 The faceted stones can be found in any color, and are often used to simulate various natural gemstones. In the 1970s, the Gilson Company developed a three-step process to make convincing synthetic opal. First, microscopic spheres of silica are created through precipitation. Next, the spheres settle in acidic water for more than a year. Finally, a hydrostatic press consolidates the spheres without distorting the stacked arrangement that creates opal’s play-of-color. 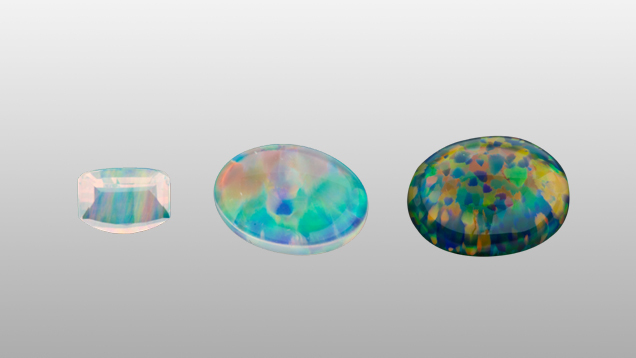 These synthetic opals are sometimes seen in the market, and to the unpracticed eye may appear to be highly valuable, natural white and black opal. Since there is not enough natural alexandrite to meet demand, various synthetics have appeared in the marketplace over the last few decades. Alexandrite has been synthesized by a number of different processes, including Czochralski, floating zone, and flux. Also, synthetic corundum with color-change is often used to imitate natural alexandrite. On rare occasions, synthetic color-change spinel may be encountered in the market. Synthetic alexandrites, such as this stone (shown in its incandescent and daylight colors) are somewhat rare. 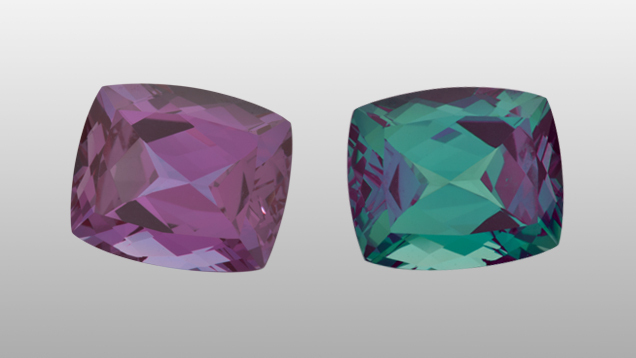 Less rare are imitations of alexandrite, including color-change synthetic spinel and sapphire.